For an exceptional showing in the landscape, give Green Dreams a try. 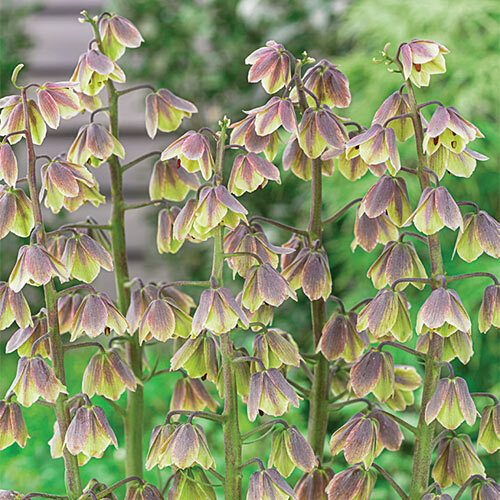 Tall, straight stems are covered in large, bell-shaped florets of pale plum washed in soft spring green. They resemble tiny wings fluttering through borders and beds. Butterflies love them! They perennialize well, returning yearly with greater vigor. Plant the bulbs sideways with 5-6" soil on top of the bulbs and 10-12" apart. Any holes on the bulbs should be pointing to the side to prevent water from sitting in the hole and rotting the bulbs. Loosen soil well before planting. Average, well-drained. Good drainage is essential, especially during the winter months.